There’s something eternal about adolescence, about its promises and deceits; and about the adolescence, blinking into light so bright that the horizon is obliterated. A teenager is pulled in many directions at once: between sensation and substance; between impulse and responsibility; between innocence and guilt; between shallowness and depth. Highway to Hell and the panting scenarios therein are sensational, impulsive, and shallow, and no less human because of it. When I listen to the songs now, my brain can go into sleep mode, and my body can listen and move, and that’s a great pleasure—one of the great pleasures that rock & roll gives us—and it’s a different thing altogether from pining for lost youth or regretting moves not made, girls not chased, drinks not downed. That Bon Scott was thirty-two when he wrote the lyrics suggests that he was an eternal adolescent, but the longer I live with the songs, the more I felt that he was blessed by this state more often than he was burdened by it. He allowed himself access to a youthful pulse that beat into a future lifting with fun, not collapsing under regret. Somewhere in this giant expanding dumpheap of memories and obfuscations I’ve talked about the first concert I ever went to. I went back to that story in my book, in a chapter on, among other things, the 1980 card of White Sox pitcher Fred Howard and Disco Demolition night and my brother and my father and regret and disconnection and stupidity. I used to think my life was one story, some form locked within stone, and once I chipped away at the stone long enough and skillfully enough I’d have it, the truth, but now I understand that I’ll never be done telling what happened, and what happened will change each time I tell it, and each time I tell it new absences will form, and the absences will call me back for yet another return, and so, for example, I’ll always be 11 years old tagging along with my big brother with our father—his ears wadded with cotton—as chaperone to Madison Square Garden to see Ted Nugent only to find out afterward that we never saw Ted Nugent at all but only saw the warm-up band before our father led a ferocious charge toward the exits, all of us under the impression that the concert was over despite the lack of any other fellow attendees leaving. My brother was the first to put the story of that night in writing, for a ninth-grade English essay, and he was the first to alter it in the telling, still too ashamed at that point about missing Ted Nugent to admit our fuckup in the essay; the teacher praised the level of detail in the first part of the essay, which described the warm-up act, and critiqued the strange vagueness of the essay’s concluding sections. “More details needed,” she wrote in the margins next to my brother’s fraudulent Nugent bloviations. In a different age, time would have made every part of the story vague. Everything becomes vague anyway, but I think my generation, perhaps the most backward-looking generation yet to walk the earth, is the first blessed with ample concrete evidence and artifacts of what, in earlier times, would have been the utterly transient particulars of fleeting youthful experiences. Whenever the story starts to feel vague, more details can be found instantly, in video and audio and print form. The borders of my mind have deteriorated and merged with Google. I am constantly searching. No question regarding it these guys are systematically the loudest indoor arena rock band from the Bon Scott years all the way through the Brian Johnson era Angus and Malcolm Young are the loudest guitar combo running through their marshall stacks both sides of the stage running them clean & overdriven getting that pure marshall sound – you can’t top that. And yes, in all likelihood they played “Sin City” when I saw them on August 4, 1979. Yes, I can even go back and watch a performance of every single one of the songs they performed that night, not from that night, exactly, but from that era. One other thing I recall from that night is that the guitarist got up onto the shoulders of the singer. 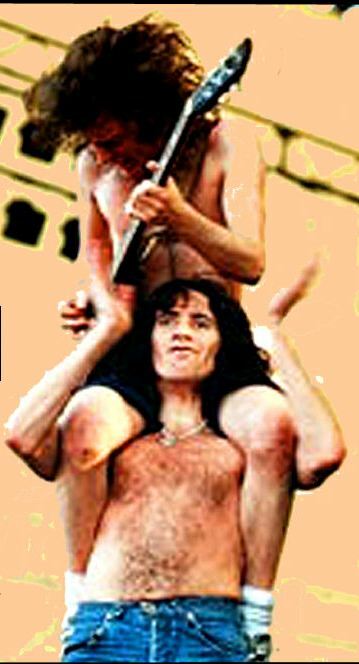 This memory was cast into some doubt when someone else who’d seen them back then recalled that when he saw them a roadie was the one giving Angus a piggy-back ride. But the photo at the top of this page, taken from the 1979 tour, suggests that what I thought I saw actually did occur. Bon Scott was not averse to carrying some weight in the name of rock & roll. I can’t say I hated AC/DC the night of August 4, 1979, but it was something like that. I was not ready for it, and it hit me like violence. Our little trio of me and my brother and my father, it was fragile. We only saw our dad every so often and only saw him for an extended period once a year, a two-week visit every summer. We were in the middle of one of those visits, the first such visit where one of us, my brother, had edged over the border from childhood into something stranger and estranging. I liked the feeling, fragile as it was, of the three of us all being in something together, but that concert, that violent assault of sound in a huge arena of lidded-eye cool guys, disallowed any closeness between us. None of us understood what was happening, and none of us were happy, and nobody could say anything to anyone and nobody could be heard. I don’t know why I soon gravitated to AC/DC. Within a year or two I had almost every record they’d produced. I’d been moving toward them anyway in my own musical tastes. I already owned several KISS records and was gradually commandeering my brother’s soon-to-fade interest in “hard rock” as my own, Aerosmith, Led Zeppelin, Pink Floyd, etc. He never did become an AC/DC fan, branching off instead into bands more clearly marketed as punk and New Wave, so AC/DC became “my” band. I liked everything about them. I liked the simplicity, the loudness, the hooks. I blasted the songs in loneliness and confusion and they blasted loneliness and confusion, blew it away. I liked that the center of the band was an older brother and a younger brother. I still like that. It’s my favorite part of a band I still love. Two brothers putting down a twin riff so tight and together it is like an artery rushing beats of rich blood from one heart. Loved/still love AC/DC, though I don’t listen to them as often any more, just because there’s so much else out there. I went through my headbanger stage, but where Judas Priest and Quiet Riot kind of faded from my vision and play list, AC/DC never did. I will definitely introduce them to my son someday. The music may be adolescent in someways, but it’s just straight-forward rock, without any of the trendy crap that froze so many other bands in place in time. Wow, I feel like listening to some right now. I can hear the bells and opening guitar from Hells Bells in my head already. Great post. I love AC/DC too, but didn’t get into them until Back in Black came out. Then when they re-released Dirty Deeds Done Dirt Cheap, I bought it and thought “What the hell is this”? But Ride On from that album is still one of my favorites. I think why we’re so backward-looking is because of the digital immigrants concept. Our parents’ generation are past the age of trying to figure out the internet, other than maybe getting onto Facebook and having an email account. Our kids, on the other hand, are growing up as though the internet has always existed. But we have our feet in both worlds, trying to preserve things from the non-digital past into the digital age that we’re going to die in some day. I like the idea of somebody reading something that I wrote in the present. But what’s far more exciting is the idea that some day my grandkids, if ever I have any, or someone who isn’t going to be born for another 20 years, can somehow stumble upon a URL that has has some stupid thought I wrote down on it. We’re still listening to Bon Scott’s legacy all these years later, so leaving one of our own in this digital medium isn’t such a bad thing. Here’s something I wrote about Rick Sutcliffe, if you’re interested. And please keep the memories coming. “… fraudulent Nugent bloviations” — I’ll be laughing about this one for weeks. To paraphrase Jim Morrison, people estrange when you’re estranging. My wife celebrated her elder son’s 13th birthday last night, and apparently the whole event descended into a madness unrecognizable to her. Just a few words into her description, where the older brother lashed out at the younger for seemingly no reason only to spiral into brooding contrition a moment later and a stony refusal to accept any cake or ice cream, I knew the ambiance intimately even at a great geographic distance from it. I referred her to my reliable touchstone for understanding, well, everything, but Bobby Hill’s rocky passage into his own teenage years was no help. Having some King Of The Hill context would have been useful; she’s just that close to perfect. I see now that Mrs for president would have been better served by reading your latest, Josh, and not just because her appreciation for AC/DC exceeds The Refreshments. “The simplicity, the loudness, the hooks”… yup, you nailed it. The part of your book that covers the ACDC concert was a hell of a good piece of writing, Josh. I will never hear ACDC again without thinking about that story. Feel free to tell this story again anytime, Josh. I knew about AC/DC only as a result of spending hours in record stores as a young teen familiarizing myself with bands I’d never heard by studying their album covers. YOU WANT BLOOD… (front cover) … YOU GOT IT (back cover) was about as spectacular as they came back then. It put KISS Alive II to shame! By the time I actually heard AC/DC I like Ian was moving onto the new wave. In retrospect they strike me as the very best at what they do, which is bring the thundah. Good point about the cover of that live album, If You Want Blood, which for those who don’t know featured shots, front and back, of bloodied Angus impaled with a guitar; that was the key piece in my transition from the gore of KISS (specifically–as Jon mentions–Alive II) to AC/DC. Why I was so drawn to gore is probably a subject for therapy. Apparently AC/DC was marginally lumped in with the punk thing for a while in the mid-70s, especially in England. And in Joe Bonomo’s book on Highway to Hell he describes them playing a surprise gig at CBGB’s in 1977. For me, I saw no reason, at least for a while–until I started trying to be cool, I guess–to distinguish between them and my other favorite band of early puberty, The Ramones. bobfinn33: Thanks for that link. Awesome.